In a large saucepan over medium-high heat, add water or chicken stock, 3 tablespoons olive oil and 2 teaspoons salt. Bring to a boil and slowly whisk in the polenta, smoothing out any lumps. Reduce to a simmer and cook until fully hydrated and creamy, about 45 minutes. Whisk in the mascarpone and parmesan and season with salt and pepper. Reduce heat to low to keep warm. Adjust the consistency by adding more water or stock if the mixture becomes too thick. In a large saute pan over medium-high heat, warm 2 tablespoons of olive oil. Add sausages and sear on all sides until golden brown, about 3-4 minutes per side. Transfer sausages to a plate and set aside. To the same pan, add peppers, onion and garlic with a pinch of salt. Cook until the vegetables begin to soften, about 3-4 minutes. Add oregano, chili flakes, and tomatoes. Season with salt and pepper and return the sausages to the pan. Simmer about 15-20 minutes, to allow flavors to come together and sausage has cooked through. Stir in the vinegar and basil. 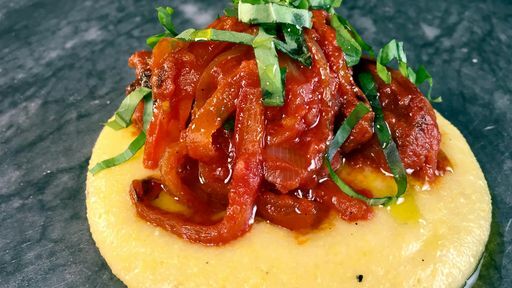 Transfer polenta to a serving platter and pour sausage mixture over the top of the polenta. Serve. Tip: Watching your waistline? Try this recipe with chicken or veggie sausage!